The latest viral video sensation sweeping social media depicts an incredible piece of wearable technology that you can use while biking, riding transit, or even in the bath. 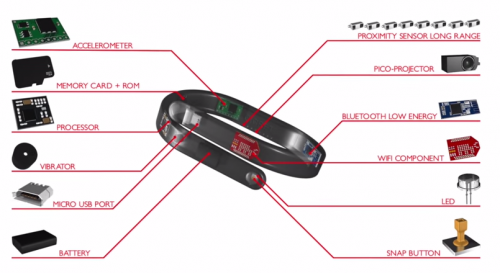 The Cicret bracelet is “like a tablet… but on your skin” the video proclaims. The users in the video are wearing a thin plastic wrist band and simply flick their wrist to summon forth an Android touch-screen surface on their forearm. Ostensibly, a projector is creating this image and a set of eight proximity sensors along the wrist band create the touch interface. The wrist band is loaded with unseen electronic components that give it all the functionality of a smartwatch and more, according to a schematic-style diagram shown in the video. To put the icing on the cake, the Cicret bracelet is advertised to be available in two storage sizes – 16 GB and 32 GB – and 10 different colours. Here’s the problem – this bracelet doesn’t exist. There’s no selection of colours available, no storage size options, no advanced projection system that reacts to your touch on your skin. What’s depicted in the video is the work of post-production special effects, not a prototype piece of technology in action. That’s because no prototype exists. For Bret Conkin, the CEO of Crowdfund Suite, he first noticed the Circret bracelet campaign when it had a brief stint on Indiegogo. “It looks too good to be true, it kind of defies your BS meter,” he says. People interested in crowdfunding campaigns should carefully consider giving money to independently run efforts, he says. Platforms like Kickstarter require a working prototype for example, but the Cicret bracelet is based on a mock-up. Although no prototype for the Cicret Bracelet exists, the video depicts components in detail. Unlike the crowdfunding campaigns we’re used to seeing on Kickstarter or Indiegogo where contributors are promised to be shipped products as soon as they’re completed, Cicret is just asking for donations with no strings attached. Pommier had previously launched an Indiegogo campaign, but closed it after raising only $1,357 of the $500,000 goal. Pommier told Augenstein he closed it because he wouldn’t be able to deliver on the product if their goal wasn’t reached. There have been other crowdfunding campaigns that promised products that seemed too good to be true, Conkin says. He points to the Healbe GoBe campaign on Indiegogo that raised $1 million but is well beyond its promised shipping date for its product – which promises to measure calorie intake automatically by placing a sensor on your skin. The company missed its promised shipping date of Sept. 22. The projector bracelet isn’t Pommier’s only project. The same website also advertises another product that does exist – in fact you can download the beta on the Google Play store right now. Cicret offers Android users a secure and private way to communicate with contacts, share files, and access files remotely through an encrypted communications channel. Its features include the ability to have your messages auto-destruct after being sent, the ability to edit messages you’ve previously sent, and to delete messages you’ve sent previously so the recipient can no longer access them. There’s a term for hardware that companies promise and is never released – vapourware. While it’s only fair to give Cicret its fair chance at developing the prototype its viral video promises, there seems to be a lot of hot air around this bracelet’s development so far.